Are you searching for Faculty Teachers Maharashtra 2019 or FacultyON Pune 2019? 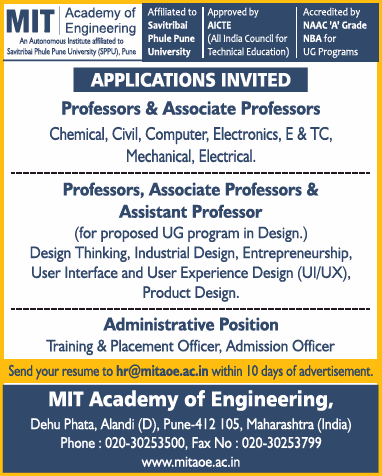 A college based in Pune named MIT Academy of Engineering, Pune has advertised in THE TIMES OF INDIA newspaper for recruitment of Professor / Associate Professor / Assistant Professor Plus Non-Faculty jobs vacancies. Interested and eligible job aspirants are requested to apply within 10 days from 30th January 2019. Check out further more details below. About College : The MIT Group of Institutions is one of the most prestigious academic groups in the state Maharashtra which comes under the aegis of the Maharashtra Academy of Engineering and Educational Research (MAEER), Pune. The Maharashtra Institute of Technology (MIT) was one of the first few private engineering institutes established in the state in 1983. As per AICTE / SPPU / Maharashtra State norms. How to Apply: Interested and eligible candidates are requested to send CV along with copies of certificates / testimonials and recent Passport Size photograph to the email address mentioned below.